Washington's glare could tear through the heart of Mike Olt.It's a paradox that has prompted the question many times: What happens when an unstoppable force meets an immovable object? In this instance, the unstoppable force is the aging of one player, Michael Young, and the immovable object is Young himself, given the continued refusal by Ron Washington to remove him from the lineup. Even in Young's absence on paternity leave this weekend against the Minnesota Twins, it wasn't enough to gain any traction on Mike Olt earning some consistent plate appearances at the Major League level. 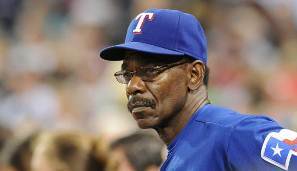 What's become painfully obvious over the last couple of months is that Ron Washington has no interest in trusting younger players to play any sort of significant role on a team that hopes to return to a third straight World Series. I won't go as far as to say that Washington doesn't trust younger players, but it's clear that he has an undying trust for his veterans. While watching yesterday's game, the subject of younger players in the lineup came up, and inevitably, that Michael Young is indeed struggling this year. I was reminded of why batting average is one of the worst ways to measure player performance, namely because it isn't really an average of anything, yet it's still the first thing we see on our television screens when a player comes up to bat. So Michael Young is hitting .271 on the season. On the surface, it doesn't look that bad. The problem is, batting average doesn't really tell the whole story. At the most basic level, a hitter's job is to get on base. Young's on-base percentage this season is .304. There are only a handful of players with a lower OBP and Young is walking at a career low rate. Not only is he not getting on base as often, but he isn't hitting with any sort of power. Slugging percentage, as a reminder, is the total number of bases divided by at-bats. Young's slugging percentage is sitting at .350, again only better than a select few players in baseball. When you combine those numbers to get his On-Base Plus Slugging Percentage (OPS), you come up with .654, a whole .200 lower than his resurgent 2011 season. It's the worst mark of any regular player on the active roster for the Rangers, and, you guessed it, only worse than a handful of players at the Major League level. Now, the line I was given was, "Well, if the team is winning, it'd be stupid to mess with what's working. People should let Washington manage the team and do what he wants. It's obviously working." While I agree that there needs to be a certain level of trust in Washington's approach, I think the problem has been created, in part, because there are such high expectations for this team. Furthermore, the team that wins the most games in the regular season won't necessarily win it all in October. The playoffs, for all their grandeur, are so much different than the regular season. It becomes a battle of small sample sizes, where a lineup that slumps for even a few days can cost the team a chance at the World Series. It becomes even more important to place the most optimal lineup on the field every day, and I'm just not sure that's the case. Young, the team's DH when he's not playing the field, has one job, the most important for a hitter in baseball: to create runs. More runs win more games. It's the the most simplified formula in baseball. Young's wRC+ (his league and park adjusted measure of weighted runs created), is sitting at 70. Only four players in baseball are worse at creating runs for their team than Young. Yes, I know I'm beating a dead horse. It's just become frustrating to watch a talent like Mike Olt ride the bench helplessly. At the very least, one would like to see a team with a 99.8% probability of going to the playoffs at least see what they have in Olt, so as to not end up with a situation like last season, when Esteban German became a pinch-hitter in Game 1 of the World Series. Beyond even that, it's important to work young players into the lineup. This is a young man's game, and when franchise's either refuse or fail to restock the Major League club with young talent, you look up one day and realize you have a roster full of overpaid veterans. Just ask the Boston Red Sox. Only the Yankees have ever had the kind of cash to withstand the effects of overpaying players who have fallen victim to father time, and despite all the success the Rangers have seen the last few seasons, they aren't the New York Yankees. So something's got to give, but the more we drive toward the final month of the regular season, the more it looks like Ron Washington will stick to the status quo, and you know, maybe we'll all look back on this and laugh when the Rangers have a World Series championship, but my fear is that, instead, we'll see Washington's insistence on consistency and riding out his veterans come back to bite the Rangers when the small details become even more important.